In May, Twitter announced the release of Lead Generation Cards, which are designed to help advertisers highlight specific offers, products, or services and capture user interest directly from within a Tweet. The cards were available on a limited basis at first, but are now open to all advertisers. 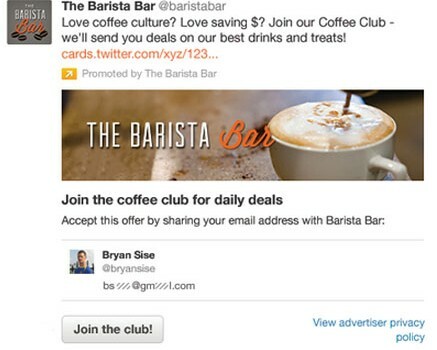 Advertisers embed a Lead Generation Card into a Tweet. 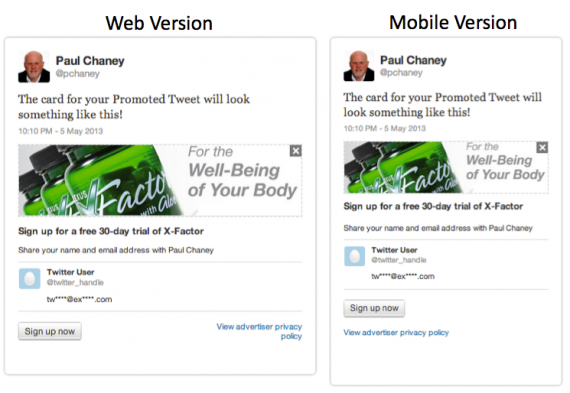 When users click to expand Tweets that contain such cards, they see a product or offer image, header text, details about the offer, and a call-to-action button. 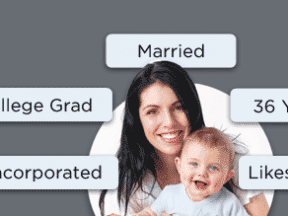 The cards automatically capture a user’s name, @username, and email address and let the person send this information to the advertiser with one click from inside the Tweet. 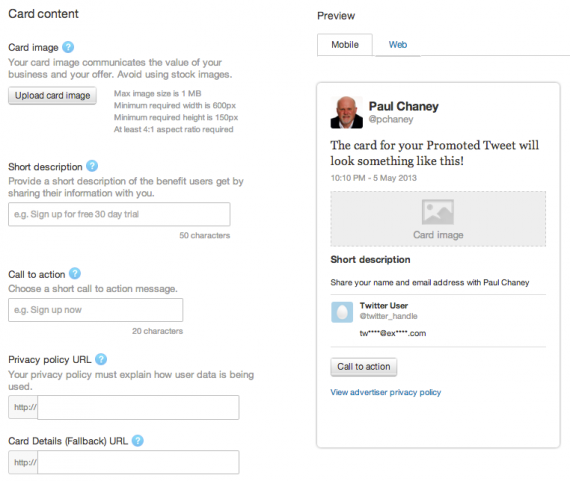 Twitter Lead Generation Cards capture a user’s name, @username, and email address. At the bottom of the card, users will see their name, @username, and the email address associated with the Twitter account. They can use the card to claim a discount, sign up for an email newsletter, or request more details about a product or service, all with a single click. Outdoor gear and apparel company Rock/Creek (@RockCreek) used a Lead Generation Card in a Promoted Tweet campaign to capture email addresses of people who wanted to enter a drawing to win a free pair of sandals. The campaign saw a 4.6 percent engagement rate and generated more than 1,700 new email contacts in less than a week. 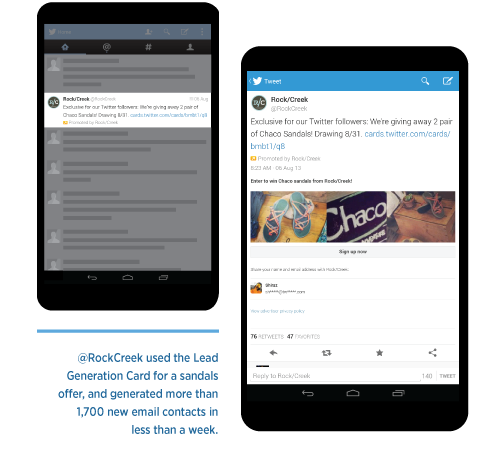 Rock/Creek’s Twitter Lead Generation Card captured 1,700 leads. Creating a Lead Generation Card is simple and requires no on-site markup or special coding. Here are the steps to set up your first card. Go to business.twitter.com and click the “Let’s go!” button to start the adverting campaign process. Go to Twitter’s business page to create a card. 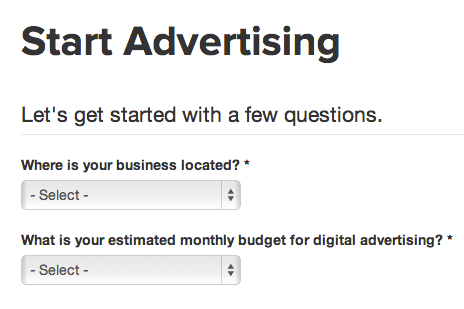 Twitter asks for two pieces of information prior to creating a card: Location of your business, and the estimated monthly ad budget. Two budget tiers are listed: $0 – $5000 and $5000 up. Twitter asks two questions before you can start advertising. Once the questions have been answered, Twitter automatically redirects you to an advertiser login screen. If you don’t already have an advertising account, one will need to be set up. Once logged in, you are taken to the advertising campaign dashboard. Look at the top of the page and click the word “Cards” to create a card. Click “Cards” to set up a Lead Generation Card. This opens the Lead Generation Card landing page. Click “Create your first Lead Generation Card” to continue. Click the button to create your first card. You are then taken to the “Card content” page, which is where you will input the needed information to set up your card. The “Create Card” page is where you enter card data. Follow these steps to create a card. Card image. This image will be shown to users as part of your card. It must be at least 600 pixels wide and have a width to height aspect ratio of 4:1. For example, if an image is 600 pixels wide it must be 150 pixels high in order to maintain the required ratio. It also has to be under 1 MB in size and use either a .jpg, .jpeg, .png, or .gif format. Short description. Provide a description of your offer or promotion that the user is signing up for. Communicate the benefit users will receive by providing you with their email address. Call to action. The call to action text is displayed on the button inside the card. Card details URL. This is the URL where users can learn more about your offer after they submit their information. This could include a product detail page, lead generation form, or the home page of your site. Advanced settings (optional). Twitter offers three advanced settings that enable you to send user data directly into a customer relationship application and match field names with those in the database. This requires technical expertise, but is an optional step. Note that a preview of the card is available as you create it showing how it will look in both the mobile and web version. Advertisers can preview the card as it is being created. Once a card has been created and saved, deploy it to Twitter by attaching the card to a Tweet. To do this, click the blue Tweet button located in the upper right-hand corner on any page in your Twitter Ads account. In the Tweet dialog that opens, click the card icon at the bottom, select a card and attach it to the Tweet. Attach the Lead Generation Card to a Tweet. Click “Tweet” to send the message that contains the card to your followers. You can also use Twitter’s Promoted Tweets advertising product to extend reach and visibility, which could result in even more leads being captured. Leads that come in through the card accumulate in your Twitter Ads account. You can download them directly from the card in CSV format by clicking the “download leads” button. Twitter Lead Generation Cards provide merchants with an easy way to capture user data, which can then be used in other forms of marketing such as email campaigns. Visit Twitter’s help page to learn more about how to use Lead Generation Cards and the benefits they provide.